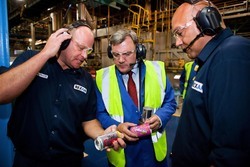 Ed Balls, a British member of parliament, recently visited Rexam’s can making plant in Wakefield. Balls, who is the MP for Morley and Outwood, was given an insight into plant performance and the can making process as well as the sustainable role metal packaging plays in modern day lives. Energy drink brand leader Red Bull has joined the drinks can recycling programme Every Can Counts as a funding partner. The news marks a major step forward for the programme, as Red Bull is the first drinks brand to become actively involved. 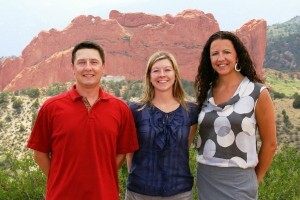 Three new sales people have joined Chromatic Technologies (CTI), the specialised ink company that provides temperature-changing colours on cans and labels of major beverage products. German can making machinery company Gebrüder-Leonhardt Blema Kircheis celebrated its 150th anniversary last month. 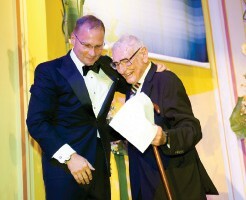 Fritz Eulitz (pictured right with owner and CEO Uwe Leonhardt), the 98-year-old great grandson of Erdmann Kircheis, who established the company in 1861, attended a party at Aue in Saxony. Mark Aegler has been appointed as the new chief executive officer of Swiss can maker Hoffmann Neopac. He has taken over from Dr Hans Jordi who has retired after 11 years heading up the company. 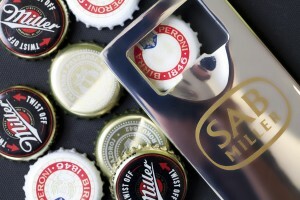 SABMiller has announced that its Peruvian subsidiary, Backus, has developed a new lightweight metal crown for beer bottles that could save the brewer US$12.6 million every year. In cooperation with Packaging Products Peru, Backus has developed a new, low-gauge bottle crown that will significantly reduce the amount of steel used in production and have a positive impact on the group’s raw material costs and CO2 emissions. Unilever has opened a new state-of-the-art aerosol plant in Mexico. The new factory will accelerate the growth agenda in North and Central America – and will double the national production of deodorants. Chinese can maker Baosteel Packaging has gained an order of 20 million cans of Qingdao beer shortly after entering the high-end beer market. The company’s plant at Wuhan started production in February and is the first to make aluminium cans. Rexam Beverage Can Europe has worked with one of its filling partners, DIS, to install new equipment that will allow the company to fill wine in cans. This installation will allow a smoother and more precise filling technique, and will ensure that cans filled with wine under the Wild Pelican brand, are 100% perfect when landing on the retailers’ shelves for consumers’ enjoyment. Aerobal has elected Takaaki Takeuchi as its new president. Takeuchi is the managing director of Thailand-based aerosol can maker Alucon, and will now head up the aerosol can making industry organisation. Andy Bolton has been named president of Crown Aerosol Packaging North America. He previously served as vice president/general manager – strategic accounts at Amcor Rigid Plastics North America. Food and drinks giant Campbell Soup has appointed Denise Morrison as its new president and chief executive officer. She will take over from Douglas Conant on August 1. Conant will step down after more than a decade in the role. He will also leave Campbell’s board of directors. 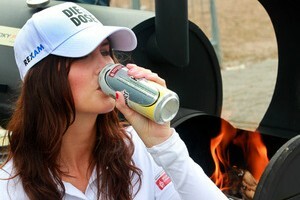 A new line of relaxation beverages has been launched in Rexam Sleek cans in the US. Marley’s Mellow Mood, the 100% natural teas and sodas that are designed to reduce stress and relieve tension, are fast becoming a leader in the growing relaxation drink category. Leading can maker Crown Holdings has selected Applied Vision to update three of its North American beverage can and end plants with inspection systems. The advanced converted end, inside can and mixed label inspection systems will be used on more than 40 production lanes. The US recycling rate for aluminium beverage cans has reached its highest level in a decade, with 58.1% of all cans recycled last year. This rate is more than double that of any other beverage container, the Aluminium Association, Can Manufacturers Institute (CMI) and Institute of Scrap Recycling Industries (ISRI) announced. Rexam has teamed up with beauty drink producer Sunlover to bring the company’s skin and tan enhancing beauty drink to market. The new beauty drink has been designed to improve the quality and life of the consumer’s skin and tan, helping to give consumers a healthy looking complexion after consumption. Leading can maker Rexam highlighted the importance of aluminium recycling at the recent World Grill and BBQ Championship in Germany. As one of the event sponsors, Rexam was able to highlight the significant impact that increased recycling rates can have on the carbon footprint of aluminium beverage cans. Envases, the UK-based aluminium aerosol can and bottle manufacturer, is investing £8.5 million (US$13.9m) in a new production line. The new line is being put in at the company’s site in Baglan, South Wales.